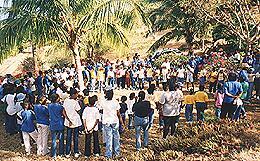 Antigua & Barbuda Girl Guides. To be a leading force, as a family organization, operating in all communities. To enable girls and young women to fully develop as responsible, productive citizens; contributing to national, regional and worldwide development. For girls and their parents, Guiding is one of the best things about growing up-not just because it's fun. Girls and young women develop skills and values, which prepare them for a richer career, community and family life. Girl Guides Hike to Orange Valley for Caribbean Link Day . Women just like you can help. You can make a big difference in the lives of some very special girls, not only as their leader, but as an important female role model. To the girls and young women they serve, leaders are among the most special people in the world. Guiding is uniquely suited to the needs and aspirations of girls and young women today. It fosters cooperation while it develops leadership potential, and builds a sense of pride in its gender and equips them to function in these complex times. Guiding gives girls an opportunity during their formative years to experiment with various roles, and develop skills and capabilities free from negativity or stereotyping. All-female organizations provide women with the opportunity to take executive and leadership positions, providing role models for girls. Membership is voluntary and open to all girls and women who are willing to make the Guide Promise. It provides opportunities in Home, Community, World, Outdoors and Camping. The leaders of the girls' Units are known as Guiders. Commissioners are officers in the Council and Standing Committees (Equipment, Public Relations, Training etc.). Other women provide service as Advisers, Trainers, Committee Chairpersons and Committee Members. Leadership training is vital, contributing to adults functioning effectively as leaders of Units, Councils and Committees, as well as providing personal growth and enrichment. 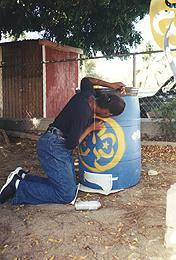 "Drum Day", a day devoted to painting drums to be distributed around Antigua as garbage recepticals. Antigua and Barbuda with a membership of over 600, is a Member of the World Association of Girl Guides and Girl Scouts, which consists of 140 Member Countries, representing nearly ten million girls and women. WAGGGS maintains four World Centres (England, Switzerland, India and Mexico). WAGGGS is divided into five regions: Africa, the Arab Region, Asia, Europe and the Western Hemisphere of which Antigua/Barbuda is a part. 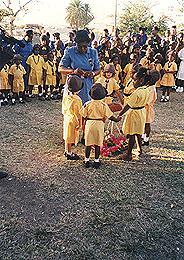 The Girl Guide Association of Antigua and Barbuda belongs to the Caribbean Link. At the introduction of the West Indies (political) Federation, the Antigua association linked with other Caribbean associations. Although the "Federation" was broken, the Girl Guide Associations' link remains.